The past two days have been a nice break from the daily riding. Although the weather was cold and rainy, I still got to see the sights…and was glad to not have to ride in it! I ran some errands, tracked down a new headlight bulb for the bike and got a haircut. 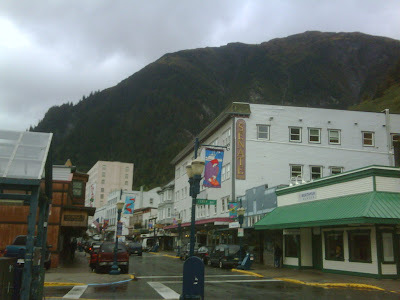 Juneau is a great town with a very walk-able and cool downtown area. I walked around with Phil, Kelly and Rebecca (and Fiona) and went to the Alaska Brewery to sample the goods! I got to spend time with Dori and lots of her Forest Service friends which was great fun! They are a great bunch of people, all very friendly, adventurous and with interesting personal stories. She also took me to an “end of the tourist season” party at a local bar…well, end of the season save for one smelly biker! The Mendenhall Glacier near town was also spectacular despite the weather. Tomorrow morning it’s up early and off to the ferry terminal to catch the fast ferry to Sitka. Day 34 – Haines, AK to Juneau, AK 09/23/10 Mileage: Local mileage and a ferry ride! Morning came and it was not as cold as it had been and was also dry. After cooking breakfast, Phil, Kelly and I made our way to the ferry terminal to hopefully catch the ferry to Juneau! Rebecca and Kevin (the biker from NY I met yesterday) already had confirmed tickets, but Phil, Kelly and I would have to play the waiting game. A ferry this size takes a long time to load, but after 3 hours of waiting…we got the OK to board…sweet! After boarding and strapping my bike down, Kevin, Rebecca, Phil, Kelly and I had a bite to eat and then adjourned to the bar for a few drinks. We didn't see a single whale....from the bar. Go figure? The scenery was spectacular as we were surrounded by mountains for the entire 5 hour trip. We passed a few lighthouses and several gushing waterfalls….but no whale sightings. Phil, Kelly and Rebecca were all staying a few days in Juneau to see the town, and with the “”Sea Alaska” pass I bought (at the recommendation of the ticket agent) I had that option as well, so I decided to do the same. I can also stay over in two other ports on my way to Prince Rupert, which after reading up on Sitka and Ketchikan, I’m planning on hitting at least one if not both of those…we’ll see. 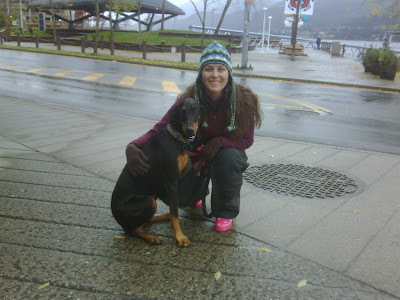 Dori (the gal I met in Denali) also lives in Juneau, so I’ll try and catch up with her as well. The morning was overcast but at least not as cold and damp as the last two nights in Homer. I said goodbye to Phil and Kelly and finished packing the bike. I had intended to go to Whittier and take the ferry to Valdez, but I completely misjudged how far Seward is from Whittier…so I quite literally would have missed the boat! Damn…I was looking forward to that. Now my only option was to backtrack through Anchorage to get back up to the Alcan and head south. My other ferry plan which I was considering was to catch the ferry from Haines to Price Rupert….which would not only cut the corner and avoid a good bit of backtracking down the Alcan, it also follows the inside passage which is supposed to be spectacular. It also makes several stops along the way and affords the opportunity to have a look around at some of those towns, most (if not all) of which are only accessible by boat or plane. Without the pressure to make the Whittier ferry, I also now had the opportunity to check out Exit Glacier just outside of Seward. It was well worth the stop and the short hike up to the glacier. In 1951, the Exit Glacier was at this sign...now it's a mile away in the background. The sun was backlighting the glacier, too bad it did not really come out in the picture. Scott and Becki had also recommended the town of Hope, so that was going to be my next stop. It’s about 15 miles from the main road and is a very quaint little town…and I mean little. I’m not sure home may houses are there, but let’s just say there is only one bar/restaurant, a café and a library….nothing else (that I saw anyway). The only bar in Hope, AK...and it's closed...damn! With that checked off the sightseeing list, now it was time to get on the gas and make tracks back up through Anchorage towards Tok Junction and the Alcan. I made it was far as Glennallen before night and the cold air that comes with it caught up to me. I found a “camp” style room for $59 at the Caribou Lodge. The shared bathroom was down the hall and the room had heat…kind of…but it was good enough for tonight. And, after 3 nights out in the tent with no shower, I was beginning to scare the wildlife when I rode by, so a shower was also part of the plan.